The makers of this embedded video claim it's evidence of a robot woman singing better than a robot woman has ever sung before. Of course, what's really happening is "she" has been programmed to copy facial expressions and pauses for breath while a recording of a song plays at the same time, much like the process that brought Milli Vanilli so much fame and success in the late 1980s. 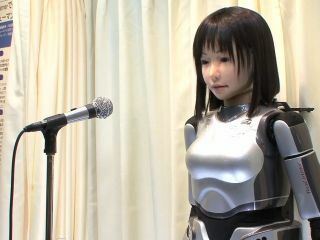 "We hope the entertainment industry will be able to make widespread use of robots" said Masataka Goto from the Institute of Advanced Industrial Science and Technology. And yes, Masataka, it already is. We call our early prototype models "Jedward". We have much, much more to learn. "Does it hurt when I go like this?" Six brave volunteers are at this moment being continually punched in the arm by an attacking robot limb. The aim of this experiment is to teach robots the limits of human flesh, so they don't accidentally tear our arms off when shaking hands or clatter us through partition walls when delivering a message deemed urgent. An Epson-made assembly line robot arm has been programmed to smack a human with blunt and sharp objects, with the volunteers judging the pain level caused by the impact. This is then fed back to the developers, so they can work out how best to protect us in the robot-filled corridors of the future. An artificial arm is being brought in to take bigger, more damaging blows. A survey of Twitter usage has found that the micro-blogging platform could actually be a bigger waste of time than previously estimated. Analytics company Sysomos worked its way through more than one billion status updates, and found that slightly more than 70 per cent of all tweets sink without trace. Their main source of measurement was counting retweets and replies. Six per cent of messages were retweeted, while 23 per cent got replies. The remaining 71 per cent were booed off the internet. If you get excited about photocopier technology, there's something very new and exhilarating on the way from Canon. The company's updated Uniflow 5 document management system lets administrators block certain keywords - resulting in a copier that could refuse to copy anything deemed sensitive or too rude for external distribution. Worse still, if you get automatically busted trying to copy something that's on the blocked list, the vindictive little machine has the ability to email a PDF scan of your document to your IT man - who can then hold you to ransom over its contents. You'll be handing him your lunch money for months.